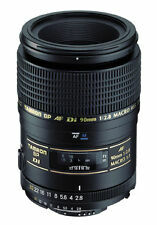 NEW TAMRON 18-200mm F/3.5-6.3 XR LD MACRO PENTAX MOUNT-with Uv Filter. Condition is New. Shipped with USPS Priority Mail. Extra Refractive Index (XR) glass can bend light rays at steeper angles, thereby decreasing the physical length of the lens while enhancing imaging performance by minimizing optical aberrations. Even more important, Tamron’s Internal Focusing (IF) system provides a much closer minimum focusing distance (MFD) throughout its entire focusing range. Lens and lens hood included. Lens cap included. Ratio: 1:5.8 (at f=210mm). Accessory: Lens Hood (Bayonet type). Length: 98.5mm. SOLID AND VERY CLEAN LENS MOUNT. Local pick-up is available. FILTER THREADS ARE INTACT. Excellent in good working order. F3.5- f5.6. 28mm-80mm Zoom lens. Lens is clear free of any haze or issues. Includes top and bottom cover, case and manual. 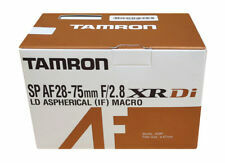 TAMRON AF 28-80mm f3.5-5.6 ASPHERICAL ZOOM LENS. SOLID AND CLEAN LENS MOUNT. 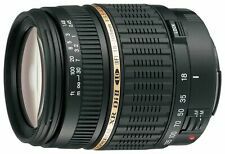 Tamron AF 18-250mm f3.5-6.3 IF Macro A18 LD DiII Pentax #1950 "Excellent"
I will look it for you. This lens works fine with no problems. I will provide courteous and responsive service. Lens&Optical system. 5 out of 5 stars - Tamron AF 18-250mm f3.5-6.3 IF Macro A18 LD DiII Pentax #1950 "Excellent"
5 product ratings5 product ratings - Tamron AF 18-250mm f3.5-6.3 IF Macro A18 LD DiII Pentax #1950 "Excellent"
Brand New in Original Box 【Product Features】 ■ Dedicated for digital single lens reflex cameras Starting from 17 mm wide angle, lightweight, compact, large zoom standard area zoom lens with F / 2.8 wide area ■ Adopting many special glass materials, adopt optical design that takes into account the characteristics of digital camera. EX: Excellent EX > EX > EX > EX. ◆Condition: EX . ◆Working condition: work properly. FP: For Parts (It does not work normally. Serious influence for a photo. Use for parts). We will provide courteous and responsive service. Brand New in Original Box . TAMRON AF zoom f3.5-5.6 28-80mm Lens for PENTAX pk mount SLR / DSLR "LIKE NEW"
(Assembled in China / Tamron Japan). AF ASPHERICAL. Shows light signs of use on the barrel. The lens is clean and clear. Almost no scratches on it. It will be reported. Perfect working order. All functions work as it should. Focal Length:70 - 210mm. Macro Mag. Filter Size:62mm. I will look it for you. This lens works fine with no problems. It has no tiny fungus. I will provide courteous and responsive service. Lens&Optical system. I participate from Japan. So I can provide you the best service. - Lens Filter. - Lens Cap(Rear). It works properly. ■ Functional. A few tiny dust but no problem in the shooting. The Tamron 90 mm is often referred to as a "portrait macro" because the focal length is also ideal for portrait photography. Special features of Tamron 90 mm 1: 2,8 DI macro 1: 1. Tamron 90 mm 1: 2,8. MINT CONDITION. It looks perfect. I will look it for you. if notified within 14 of the receipt. If you are looking for a particular item. I will look it for you. up -do not confuse them for. The AF, Di lens features Auto Focus and is designed to be used with: SLR bodies. 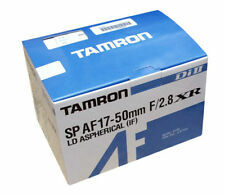 Product Line Tamron Sp. 3pcs extension tube with this lens will be given as a GIFT ! Extension tube never used. Product Key Features. This includes sealed boxes, or sealed accessories and manual/software included in boxes. View Our Categories. A few Fungus in the Lens. There is a few fungus in the front and rear lens. Appearance is beautiful. There is no oil stain on the aperture blade. Focus ring are smooth appropriate. Serial no: 114003. Type: 35mm Single lens reflex lens [AF / zoom lens]. Minimum shooting distance: 0.33 m (zoom all area). Total length: 92 mm. Standard accessory: flower form hood. We will try our best to resolve the issue!